Matching the puppies to the right family is a very important and difficult task. 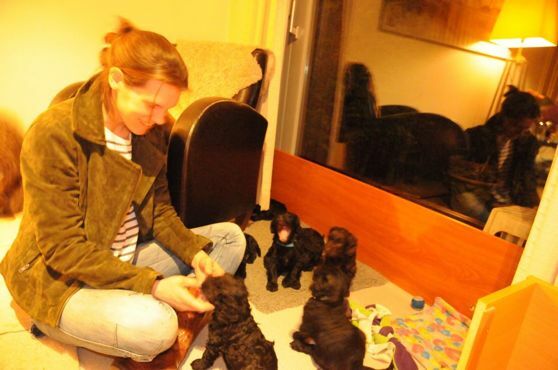 Sometimes people who want a puppy find it surprising (and disappointing) when I tell them that they can not choose the puppy themselves, and definetely not by colour. Within a litter there are a wide variety of characters; dominant/humble, relaxed/tensed when meeting new things, very energetic/medium energetic, independant/dependant, follows/goes his own way, hunting interest and so on. The familysituation, small children or not, other dogs in the house, dog experience, plans for the dog etc are facts that I take into account when doing this match. A good match will make both the dog and the family happy! So I continually observe the dogs from the very beginning to find out what their main features are. The characters developand become more clear as the puppy grows. This week the dog behavioral specialist, Myrthea Rozendaal, came to test the dogs' characters with me. It was very interesting and I learned much about the characters of the puppies. We let them come into a room where they never had been before and Myrthea was sitting on a low chair there. Then we observed the dogs' behaviour with a stranger, willingness to play, reaction when held etc. This was a big help for me in the matching process which is coming to an end this week.